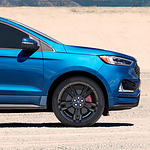 You can change the feel of your Ford Edge ST with the slightest hand movement. The Sport mode feature allows the driver to press a single button to change the way the vehicle performs. You'll get an immediate boost to shifting that will make the vehicle accelerate faster to conquer the road. Visit Blake Utter Ford to feel the power of the Edge ST for yourself. See what you can do with an SUV like this in Denison.